Why hello! I have literally been "trying" to blog for the past four hours. I started outside, it was too hot and bright, moved inside, got hungry, ate lunch, received a phone call from one of my favorite people in the entire world... and then spoke to her for about three hours. Love that. Plus, since I can't sit still while I'm gabbing away (I walk around instead), it was quite a good workout ;). And then instead of the simple bread and butter, we were served flatbread and hummus along with our chilled "message in a bottle-type" bottle of tap water. Yep, they had me at hello. To drink, my date and I (most of my friends bailed last minute) wanted wine. Or I wanted wine, he just agreed to it, and then we ordered a bottle. I didn't photograph it but it was a deliciously light pinot noir from the Martin Scott Winery. Have I mentioned that Haven has an incredible wine list, and micro-brewed ale selection, and an array of micro-distilled spirits? The entire experience was perfect, until it came time to order. Everything sounded fantastic! 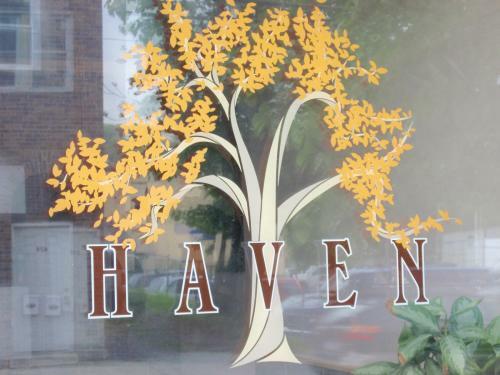 Another wonderful quality about Haven? Since they serve "market-driven"food, the ingredients, and thus menu, are constantly creatively changing with the seasons. They claim, however, that the comfortable and friendly atmosphere stays the same and I'd agree. I was ridiculously pleased with the service; and not just because we were having a late dinner, on a Tuesday night, and were one of two tables, although we were :). By the way, eventually we did chose our dinner entrées. I enjoyed the Ravioli of Wild Mushroom, Olive & Spinach topped with the Truffled Cauliflower Puree (one of many vegan options) and my friend had the Five Spiced Pork Chop with Roasted Potato, Leek & Raisin in a BBQ Sauce. Ahmazing. I can't say it enough. I'm so glad to have found such a great restaurant so close to home, and I can't wait to go back. In addition to just being awesome in every way (I am such a foodie dork) they are hosting quite a few events this summer: New York, New York, wine dinner hosted by one of Long Island's best wine estates, East Meets West, sake tasting, and Rediscover California, wine tasting from one of the lesser well known but equally as impressive regions of Cali. If you could join me, (can you?) which one would you want to go to the most? And, what's your favorite local (nearby & serves food from the area) restaurant? I know I'm late on this but Congratulations on your graduation! What an amazing accomplishment. Yum, mushroom ravioli - so addicting! I first tried it at Macaroni Grill and have been hooked ever since. Brittany: Oh, and it is. Thank you so much! BroccoliHut: You got that right ;). lovelyascharged: My gosh, I am officially hooked.